With a free day to explore before your cruise, take time to enjoy the warmth and glow of Christmas tradition. Follow your visit to Colmar with a free afternoon in Breisach, and browse the lovely Christmas market to sample bretzels, mulled wine, and Black Forest cake. CLASSIC Enjoy a Guided City Walk, including a visit to the Gutenberg Museum to see the captivating history of printing. In your free time in Mainz visit the local Christmas market: explore at your own pace to soak up the sights and sound. Sail through the Rhine Gorge to Rüdesheim, past the legendary rock of The Lorelei–where the siren of mythology sang songs to lure ill-fated sailors. Don’t miss the tantalizing treats, and seasonal handiwork of sparkling winter wonderlands in Koblenz. You’ll board your Avalon Suite Ship® in Basel, Switzerland. 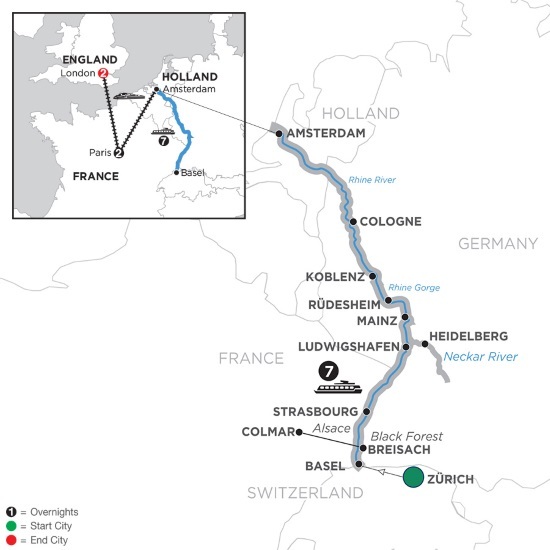 Sail for Breisach, Germany, the gateway to the Black Forest, an area of unrivaled natural beauty. Explore the warm and friendly Christmas market with traditional festive offerings. Continue your river cruise to Strasbourg, France, home to one of the oldest and finest Christmas markets in Europe with a spectacular Christmas tree. You’ll disembark from your ship and travel by high-speed train to Paris to enjoy your Monograms vacation package with two nights each in Paris and London. Begin with a guided tour of the City of Lights, and see the iconic sights, and join a Seine river cruise. Next, you’ll travel via high-speed train from Paris to London. Enjoy a guided tour with your local expert, and go inside St. Paul’s Cathedral, where Prince Charles and Lady Diana were married. Your Monograms Local Host® is available during your stays in Paris and London to assist you!